On this page, you will find 15 easy tips to create an attractive professional email signature illustrated with examples. Also, we will have a closer look at 4 online HTML email signature generators that provide a collection of free email signature templates. Research shows that an average office worker sends 30 - 40 emails daily. And do you know how many of those e-mails have a signature? Yep, every single one! Naturally, when you are doing something that often, you'd want to make it right. No wonder that so many people search for sample e-mail signatures every time they get a promotion, change jobs, or try to connect with a promising prospect. On the web, you can find plenty of tips and a handful of email signature generators that let you create a personalized html e-mail signature based on a template. In this tutorial, we will have a closer look at 4 most popular online generators that provide a collection of free signature templates. But our primary focus will be on best practices and inspiring email signature examples to help you create a compelling professional email signature, which will be a small but vital part of building your business and brand identity. If you ask me what makes a good email signature, I'd say it all boils down to the following. A professional email signature is concise but informative, it's not frilly but not plain either, it's simple but not dull or boring. Sounds like a tricky task? Then check out the following list of do's and don'ts that will help you avoid common mistakes and create a lovely attention-catching email signature. Don't include needless information in your signatures. Excessive details, links and quotes can make your signature look cumbersome, which will deter most people even from looking at it, let alone clicking your links. If you are dealing with international recipients, don't forget to add an international prefix to your phone number, e.g. +1 (555) 123-4567. Don't include anti-virus scanning verification or a legal disclaimer in your signature, unless absolutely required. Here's an example of simple and elegant email signature design that puts all relevant information in the upfront, and is easily navigable. 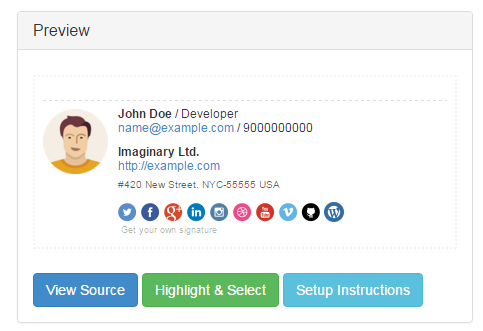 Nearly in every email client, the sender's email address is displayed in the From field. If not, hovering the mouse over the sender's name will display it, or you can simply hit the Reply button like most people do. So, including an email address in your signature is just a waste of space. It's like placing two return address labels on an envelope, or introducing yourself to someone when you first meet, and then doing it again right before you leave. One of the online email signature generators claims that users who added a photo to their email signatures got 32% more replies to their emails! Can that really be true? Well, research shows that people remember images better then text, and the most memorable images are those that contain people. So, if you want to stand out from the crowd, consider including your photo in your signatures. 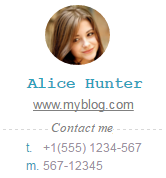 Just compare the following email signature example with its counterpart in Tip 1. One small change makes a big difference, uh? Stay away from using too many colors, fancy fonts and overly small or large text size. By including a ton of different colors and fonts, you increase the risk of creating a tasteless and distracting email signature design. Just look at the below signature. What would you say about a person with that sign-off? Try not to use too many graphic elements to keep your signature design simple and elegant. The classical "less is more" philosophy works great in this case. If you include more than one graphic element, balance them out with a minimalistic design of text elements. When designing an email signature, think which information your contacts should see first, and visually direct the eye to those important elements, for example your personal name, company name, your blog or a web-site. Any way, be sure to put that key element in the top position and make it stand out by using a larger font size, brighter color, etc. To show off your professional brand and drive traffic, include a link to your web-site and social media profiles. Typing full URLs can make your signature look cluttered and crude, while short hyperlinks can help you create a neat and compact signature design. When including social media icons in your email signature, it's very important to keep the balance, otherwise you may get the result quite opposite to what you expected, which leads us nicely to the next tip. A common mistake that many people make when designing business email signatures is adding a quote in the last line. While this is absolutely acceptable for personal communication with friends, you'd better leave quotations out of your formal signature. You never know which quote might give a wrong impression or offend someone, so it's just not worth the risk. If you do want to include something special in addition to the usual email signature essentials, why not encourage people to visit your web-site or blog by including your company tag line or other call to action? "Spend too much time on email communication? See how to reply with template in a click!" Guess whose signature generated more downloads? It is a good practice to include a longer signature on your first email, and in subsequent emails use a shorter signature that includes just the essentials such as your name, company, phone, and website link. Needless to say, these days people often send and receive emails on the road, and therefore chances are that your email will be open on a mobile device rather than on a desktop email client. Apart from simplicity and light-weight graphics, scalability is the most important aspect to consider when creating your signature. Be sure your text is readable and graphics is legible when scaled down onto smaller screens. Some people say that adding a line like "Sent from my smartphone" is pointless and even irritating. It is indeed, if you always use correct spelling, grammar and punctuation regardless of whether you are writing from your computer or phone. And if you don't, know that people tend to be more forgiving of errors in emails signed with "Sent from my iPhone" and the like. Please excuse any typos as it was sent from my iPhone. Sent from my iPhone. Please forgive the typos and brevity. Sent from my smartphone, all typos and error self inflicted. Once you've designed a great professional email signature, be sure to test it in as many email clients as you can. Be especially careful with HTML formatting because it may not appear the way you want for everyone. Just because your html email signature looks nice in desktop Outlook or Outlook.com, it doesn't mean it will work perfectly in Gmail as well. If you are curious to know the exact steps, you will find them here: How to create a professional Outlook email signature. 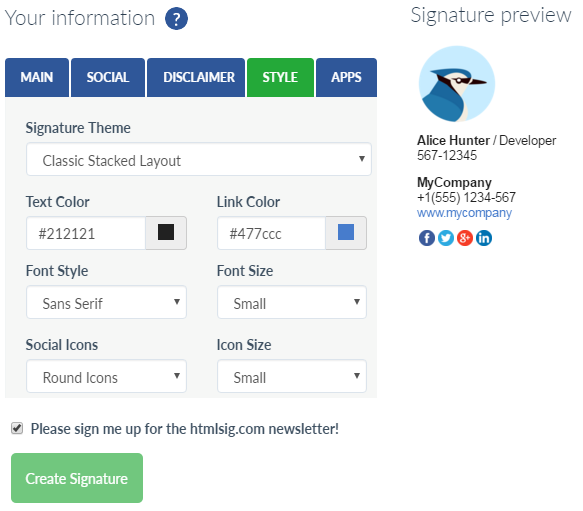 In case you are looking for a professional signature design, you can utilize one of the ready-to-use email signature templates offered by online signature generators. There exist plenty email signature generators on the web, and you quickly find them by typing something like "free email signature generator" in the search box of your favorite search engine. Alternatively, you can check out 4 free signature generators listed below, which in my opinion are the best offerings on the market. WiseStamp lets you choose from a collection of professional email signature templates, customize the color scheme, add your photo, include links to your web-site and social profiles, automatically share your latest blog or social content, quotes, and more. This signature generator integrates with all major online email platforms, including Gmail, Outlook.com and Yahoo! and automatically loads your beautifully designed and personalized signature as you are composing an email. If you want to export your signature to a desktop or mobile email client such as Microsoft Outlook, Mac Mail, IOS Mail, and Thunderbird, then you will need to buy the Pro plan (at the moment of writing the price is $4/mo.) The Pro plan offers a number of professional email signature templates and extra design features, removes WiseStamp branding, allows you to create multiple signatures and associate them with different email accounts. The good news is that Newoldstamp allows exporting your customized signatures to all major email clients free of charge, including Microsoft Outlook, Outlook.com, Gmail, Yahoo, iPhone Mail, Mac Mail, and Thunderbird. The paid Premium version provides up to 100 templates depending on the selected subscription type. You can check their pricing here. Please be aware that your free email signature will be saved only for 30 days on their system, during this period you can come back and make changes. If you would like to make edits after that, or if you plan on managing multiple signatures, you will have to set up a paid Basic or Pro account. If you are looking for a simple neat html signature with just essentials and no unnecessary frippery, try out Signature Maker. Currently, they offer just one email signature template (please see below), but it's absolutely free and can be used both in online and desktop email clients. To add the signature to desktop Outlook, click the Highlight & Select button, press Ctrl + C to copy it, create a new signature in Outlook, and paste the copied signature there. All text and graphic elements are editable, and you will be able to make any changes any time you want. I hope these examples and tips have given you some inspiration to create your own beautiful signature. If you know some other tips or tricks or want to share your inspiring email signature examples, you are most welcome to leave a comment! 4 Responses to "Create professional email signature - examples, templates & generators"
You've got some great tips here for creating a signature. And thanks for the WiseStamp mention! ZippySig is another online based email signature generator that I thought should be included in this list. Again I got a problem in using Excel and need your help. I make a button in excel but I can't work with Macro to use the button going from my main sheet to another. I searched in internet for this issue and there were many tips but non worked. Can you please share a link of using Micro lessons by which I will be able to set up buttons to go from one sheet to another sheet of the same Excel Workbook. Thank you very much for all your supports and help :).